Young Estates & Land Ltd offers companies from the business start-up, to the growing commercial organisation and the serious manufacturing industry, a flexible working environment in which their business can create firm foundations and expand successfully. Unlike many modern business estates we pride ourselves in providing true industrial estates welcoming occupiers from all areas of industry from steel fabrication to light manufacturing and desk based business services. For an indication of the diversity of the tenants on our estates, see our current occupiers page. Whilst we aim to provide smaller affordable start up units we recognise the importance for companies to be able to expand and therefore provide a range of units from 700 sq ft to 17,000 sq ft. 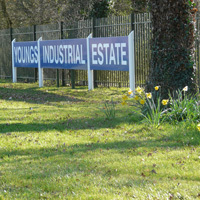 Currently Young Estates owns and manages estates in Aldermaston, Berkshire and Leighton Buzzard, Bedfordshire. As part of our expansion programme, we are actively seeking opportunities to grow our portfolio and welcome enquiries from those owning land with development potential. Call us on 0118 981 7166 or click here to contact us.